Click here to view and print the brochure. The Incredible Years program, which began in Washington State and has been replicated across the nation, has been implemented in our area by Southwest Iowa Families since 2007. It is a research based, effective program for reducing children’s aggression and behavior problems and increasing social competency at home and school. SWIF offers preschool classroom curriculum in collaboration with local teachers and school districts, funded by area grants. This curriculum has been used in Fremont, Page and Taylor counties. 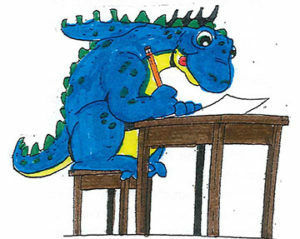 To bring Dinosaur School to your area or your program, contact Sandy at (712) 542-3501. Therapy groups are available for small groups of children with specific needs, in collaboration with SWIF therapists. These have been offered in Bedford, Clarinda, and Villisca. To request an evaluation for a group, contact SWIF at (712) 542-3501 or talk to your child’s therapist. HI! We’re looking forward to seeing you when you come to Dinosaur School. 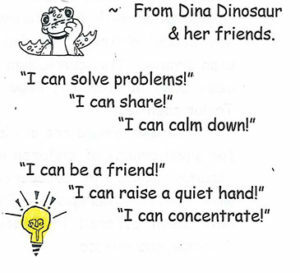 Dinosaur School is a place where children come to make new friends. You’ll be playing with some interesting toys and be playing games with other children. You’ll do art projects, put on puppet shows and watch videotape programs. We even have snacks and prizes! Carol Brehmer, MA, is the Dinosaur School Coordinator.